BANDA ACEH, Indonesia, April 16, 2018 /PRNewswire/ — Aksi Cepat Tanggap (ACT) delivered 40 containers of emergency aid for the Humanitarian Ship, carrying 1,000 tons of rice for Syrian refugees on April 15, 2018. Those containers were shipped from Baiturrahman Mosque in Banda Aceh to Belawan port in Medan and bound for Turkey, where Syrian migrants have been granted a temporary protection. The emergency aid was donated by Indonesian citizens and sourced from Acehnese farmers, as the province known as the Veranda of Mecca -always produces surplus in its rice harvest. The ship will sail on April 21st from the Belawan port, Medan. “It will be sent to Syrian refugees through Turkey. Amongst 12.5 million of Syrian refugees, around 3.5 million of them are in Turkey. Thus, it is important to cooperate with Turkey in helping those refugees,” said President of ACT, Ahyudin, in his opening remarks. It is expected to reach Turkey within a month. 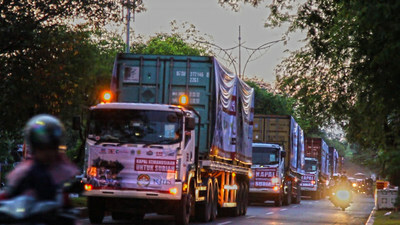 The event concluded with prayer and the release of the aid convoy to Belawan port by the Mayor of Banda Aceh, Aminullah, the mother of the Governor of Nangroe Aceh Darussalam (NAD) province, and the President of ACT, Ahyudin accompanied by Ulema and thousands of Acehnese who flew the flags of Indonesia and Turkey. In the event, a number of Indonesian Muslim scholars from Aceh to Papua came to give sermons, including the Saudi Arabian scholar who is now an Indonesian citizen, Sheikh Ali Jabeer; Acehnese religious leader Tengku HM Yusuf A. Wahab; Deputy of the Consultative Assembly of Acehnese Ulema, Tengku H Faisal Ali; Jakartan cleric, Ustaz Heriwibowo, Lc; and Papuan cleric, Ustaz Fadlan. Sheikh Ali Jabeer expressed his happiness to accompany the departure of the Humanitarian Ship, bringing 1,000 tons of rice to the people of Syria who are being hit by misfortune. “The 1,000 tons of rice distribution will be the beginning of prosperity for Aceh, even the prosperity for the Indonesian nation. Turkey can prosper because of its generosity to Syrian refugees, Aceh will also experience the same after sending 1,000 tons of this rice,” said the Medina-born scholar. Within two years, ACT has distributed more than 5,000 tons of rice and medical equipment to war-affected areas around the world like Myanmar, Somalia, Gaza and Syria. Currently, on the global scale, ACT continues to develop networks in the form of representative persons to prepare ACT offices abroad. The global program activities have reached 43 countries in Southeast Asia, South Asia, Middle East, Africa, Indochina and Europe. ACT’s working area begins in every humanitarian tragedy in different parts of the world such as natural disasters, hunger and drought, conflicts and wars, including the oppression of minorities of various countries.